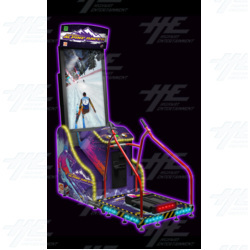 A team up between BANDAI NAMCO and Raw Thrills, the Super Alpine Racer sees players racing through new ski slopes and courses. The game includes new characters, a vertically mounted 55 inch HD screen, and the ability to verse other players. The game also has built in air blowers to make the feeling of down hill skiing even more realistic.